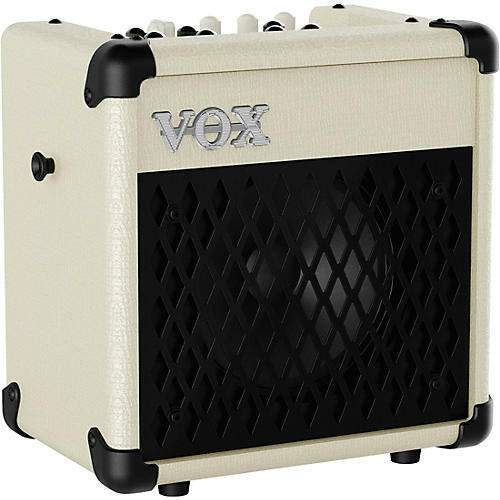 The VOX MINI5 Rhythm offers 11 amp sounds inherited from the popular and acclaimed Valvetronix Series, plus eight effects and a new rhythm function. You can choose from 99 different variations of rhythm patterns to back your performance or practice along to. The compact body also packs plenty of additional functionality such as a mic input, AUX input, and a dedicated E-string tuner, letting you play your guitar with the high quality tone you'd expect from VOX. Dimensions (WxDxH): 269mm x 179mm x 267mm / 10.59" x 7.05" x 10.51"
Weight: 3.5 kg / 7.72 lb.